This popular Vancouver Island vacation destination that offers the best of Canada's West Coast! Leaving Port Alberni, Highway 4 travels west to climb around Sproat Lake through the stunning mountain scenery of the Mackenzie Range and along Kennedy Lake to reach the west coast of Vancouver Island and the communities of Ucluelet and Tofino. The Nuu-cha-nulth native Indians used the name Ucluelet, which means "safe Harbour" when they settled a fishing village in the area centuries ago. Industry was established when a fur trading post was built, followed by a sawmill and logging operation in the 1880's and the growing fishing industry in the 1920's. 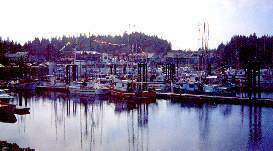 Ucluelet remains the third largest port in BC for landed fish catch. The forest industry remains important in the fabric of this West Coast community. In Ucluelet, everything focuses on the Pacific ocean; sportfishing for salmon and bottom fish, whale watching, nature cruises, eco adventures, beachcombing, sea kayaking and diving draw visitors from around the world. Prime time for whale watching vacations is from mid-March to mid-April when Pacific grey whales are on their migration route from Mexico to the Arctic Ocean. Summer brings national and local artists to the Summer Arts Festival and the Arts School, while Ukee Days features logger sports and children's shows. This is the place where land and ocean meet. Nearby Vancouver Island locations include Pacific Rim National Park and Long Beach that offer miles of sandy beaches, ideal for beachcombing and storm watching. Walking and biking trails traverse the West Coast rainforest. Barkley Sound and the Broken Group Islands are a stunning setting for British Columbia eco adventures. Access: Ucluelet is 100 km (62 mi.) west of Port Alberni, on Highway 4 or 295 km (183 mi.) 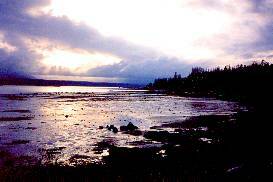 northwest of Victoria, on Vancouver Island in British Columbia. There is also ferry service across Barkley Sound plus bus service from other communities. Accommodations: Visitors to the Ucluelet area can stay in cozy motels, hotels, and resorts or camp in one of the private campsites or a nearby British Columbia Provincial Park. Recreation Facilities & Activies: golfing, fishing, whale watching, nature cruises, eco adventures, diving, sea kayaking.